Founder Series - Superb cleaning backed by Oreck durability. Oreck® Magnesium™ RS - Meet Magnesium™ RS, the newest addition to the Oreck Magnesium model line! Like the original Magnesium, it's got incredible suction power but more features. At 7.7 pounds*, Magnesium RS is the lightest, full-powered, swivel-steering upright in America. 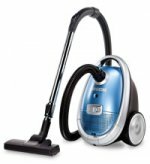 Oreck VersaVac™ - Meet Oreck's newest, most versatile vacuum: The VersaVac™, a full-powered bagless vacuum that is also a steam mop. 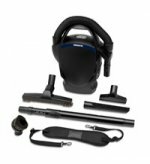 Oreck ® XL Edge® Upright Vacuum - The Oreck Edge offers incredible versatility with its revolutionary Versa-Glide® true floating head that lets you move easily from hardwood floors to deep pile carpet. Quest® Canister Vacuum - Apartment-Sized Vacuum. Mansion-Sized Clean. Little Hero™ Canister Vacuum - Portable power that tackles almost any cleaning challenge. Portable, powerful performance that’s perfect for removing problem pet hair. Features a 15 ft. cord with cord-wrap storage in baser and convenient carrying handle for quick cleanups. Permanent wheels give it easy maneuverability. Bagless design with 2.4 quart dirt capacity and washable exhaust filter. Ultimate Handheld Vacuum - A portable, lightweight and powerful vacuum perfect for hard-to-reach spots and above-the-floor cleaning. Five specialized accessories tackle virtually every job and include a telescoping extension wand, dusting brush, crevice tool, upholstery tool, and a large floor tool with plush horsehair fibers. A two-setting shoulder strap lets you carry the vac in your hand, or wear it over your shoulder! Comes with a 3-year limited warranty**. 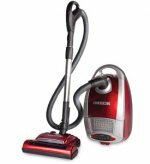 Quest Pro Canister Vacuum - Anything anybody could ask of a canister vacuum, the new Oreck Quest™ Pro delivers in super abundance. Four 360° pivoting casters allow it to move easily on all floor surfaces. Includes a 5-foot hose, dusting brush and a crevice tool. Separate motor in the powered floor head drives the extralong pile lifting roller brush to comb and groom carpet fibers and help loosen dirt. Six height settings to adjust for different carpet pile heights such as Berber, plush, textured, loop, and frieze. Easy step pedal controls the power, power head brushroll, cordwinder, carpet height adjustment, and wand release.